Beautiful unique greetings card, each one hand painted in encaustic wax. 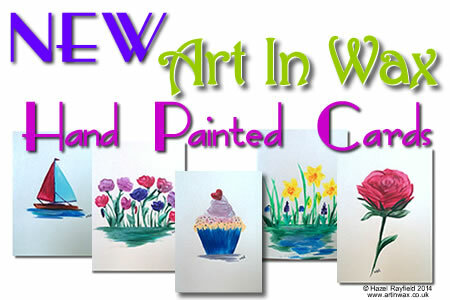 A brand new range of hand painted original Art In Wax greetings card is now available. I have painted a selection of pictures direct onto greetings cards. Each card is hand painted, in hot wax, directly onto A6 size 250gsm pastel pearlescent card stock, the cards are a variety of soft pastel shades, cream, gold, a blue/green, peach and a pretty soft pink, each comes with a matching 120gsm envelope, they are all initialed on the front of the card and have an Art In wax sticker on the back and are packaged in a cellophane bag. The card itself has a shimmer and the wax a nice soft sheen, as this card surface is more absorbent than the specialist gloss card I use for my paintings the effect is a bit different. This unique and original piece of art as a greetings card, makes a great gift on its own but together with a piece of Art In Wax would make a lovely present for many types of occasion. Every piece of Art In Wax is unique, weather its on a card or a large mounted piece of wall art. Some subjects are similar as I love to paint flowers and landscapes, and many of the cards reflect subjects from my larger paintings …… but none of my paintings are exactly identical. 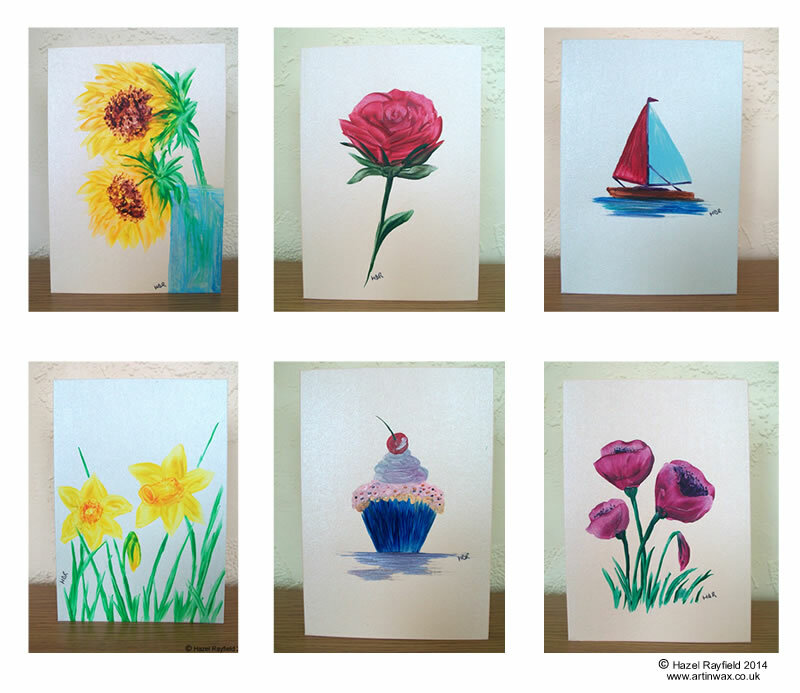 Sunflowers, Rose, Poppies, Cupcakes, Boats, Spring Flowers ……….